The Guardian reports, 29th December 2017: Britain’s homes could be lit and powered by windfarms surrounding an artificial island deep out in the North Sea, under advanced plans by a Dutch energy network. The radical proposal envisages an island being built to act as a hub for vast offshore windfarms that would eclipse today’s facilities in scale. Dogger Bank, 125km (78 miles) off the East Yorkshire coast, has been identified as a potentially windy and shallow site. The power hub would send electricity over a long-distance cable to the UK and Netherlands, and possibly later to Belgium, Germany, and Denmark. TenneT, the project’s backer and Dutch equivalent of the UK’s National Grid, recently shared early findings of a study that said its plan could be billions of euros cheaper than conventional windfarms and international power cables. The sci-fi-sounding proposal is sold as an innovative answer to industry’s challenge of continuing to make offshore wind cheaper, as turbines are pushed ever further off the coast to more expensive sites as the best spots closer to land fill up. As each further mile out to sea means another mile of expensive cabling to get the power back to land, the firm argues a more innovative approach is needed. That long distance cable, an interconnector, would give the windfarms flexibility to supply whichever country’s market was paying the most for power at any given time, and mean the power almost always had a use. To accommodate all the equipment, the island would take up around 5-6 sq km, about a fifth the size of Hayling Island in the English Channel. While the actual engineering challenge of building the island seems enormous, Van der Hage is not daunted. “Is it difficult? In the Netherlands, when we see a piece of water we want to build islands or land. We’ve been doing that for centuries. That is not the biggest challenge,” he said. While TenneT could shoulder the estimated €1.5bn (£1.31bn) cost of building the hub at the project’s heart, it is not allowed to build power generation so that would be left to the likes of offshore windfarm developers such as Denmark’s Ørsted and Germany’s Innogy. However, to get them on board TenneT needs to find other energy network operators, such as the UK’s National Grid, to help pay for the long-distance power cable. The next steps for the plan will come during 2018 in the shape of a roadmap published in the Netherlands. 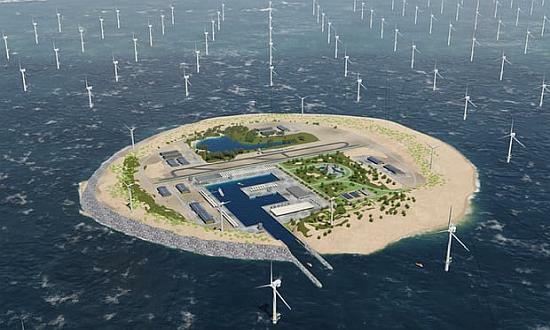 If all goes well, Van der Hage said the earliest the island could be operational is 2027, with the windfarms to follow. The ambition for the scheme is sky-high. TenneT thinks the project could handle windfarms with a capacity of 30GW, more than twice today’s total installed offshore wind power across the whole of Europe. However, that scale could entice new investors. Anglo Dutch oil firm Shell recently doubled its clean energy budget, but has said offshore windfarms — despite usually costing billions of pounds each — are not big enough yet for it to invest in them in a major way. The idea has received a tentative welcome and businesses say the idea is not as far-fetched as it might sound. Hans Bunting, chief operating officer of renewables at Innogy SE, which is not involved with the project, said the plan was “very interesting” and credible. Denmark’s ambassador to the Netherlands said the plans and vision are interesting. The Crown Estate, which owns most of the UK seabed and would benefit from licensing it for the turbines and island, is working with TenneT to explore the idea. National Grid described it as offering an “innovative design that could play an important role in the long term”. However, experts said there were still big questions to answer about the financial case. Peter Atherton, energy analyst at Cornwall Insight, said it was true that the best nearshore sites had been taken already, but the power converters that TenneT planned to build on the island were costly and relatively rarely used in energy infrastructure.